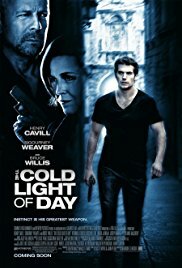 After a family holiday on a large yacht in the Costas goes disasterously wrong, Will, a young man with business problems finds himself on the run in Madrid after his father has been shot, chased by the CIA and in pursuit of a brief case, which, if he can retrieve it, will result in his family being freed by those holding them hostage. During his search hidden facts about his now dead father are revealed. Scenes on the yacht in port and at sea, chases through the darkened streets of Madrid, mostly on the back of a motor scooter, chases through the streets of Madrid in cars. One or two shoot outs, mostly with hand guns. An extended chase through the streets terminating at Ventas and then a lot of shooting in an underground car park. There are girls in bikinis on the yacht and on the beach and a bit of drinking. A View Since I live close to Madrid I quite liked the scenes in places I knew quite well, but other than that it was pretty dire, and I really wondered about the CIA lady randomly shooting passers-by in the street. The climax was terrible; not surprisingly it got 17% on Rotten Tomatoes and despite its quite moderate budget did not anything like gets its costs back. Additional Info Henry Cavill was to go on to become the new Superman, well, he could certainly run with a gun.